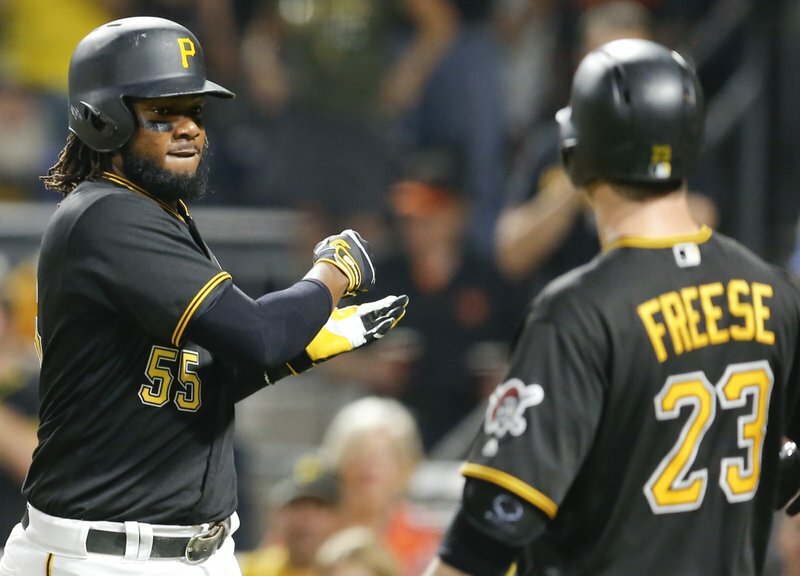 PITTSBURGH (AP) — With four games remaining in their season, the Pittsburgh Pirates will likely finish next-to-last in the majors in home runs. But rookie first baseman Josh Bell is a sign for hope in the future. Bell hit a two-run shot as the Pirates beat the Baltimore Orioles 5-3 on Wednesday night to sweep a two-game interleague series. Bell’s home run, his 25th of the season, came in the third inning off Baltimore starter Gabriel Ynoa and put the Pirates ahead 4-3. Bell also hit an RBI single in the first. He’s the first Pirates rookie to hit 25 homers since Jason Bay set a franchise record with 26 in 2004. Bell’s homer outburst as a rookie is made more impressive by the fact the most he ever hit in a minor-league season was 14 in 2016. Ynoa (2-3) lasted just three innings and gave up four runs on five hits. He struck out three. Gregory Polanco homered to lead off the second, his 11th this season and first since August 4. Starling Marte singled and stole second in the fifth inning, giving him 20 steals for the fifth consecutive year, despite an 80-game suspension for violating baseball’s performance-enhancing drug policy. Chad Kuhl (8-11) went five-plus innings, allowing three runs on eight hits. He had five strikeouts, including two against Manny Machado. All the damage against Kuhl came in the second. Chance Cisco and Anthony Santander hit RBI doubles, sandwiching J.J. Hardy’s run-scoring groundout. Pedro Alvarez started the rally with a single in his first game at PNC Park since leaving the Pirates. He played for Pittsburgh from 2010 to 2015 and was greeted with a warm reception by the crowd. Felipe Rivero pitched the ninth for his 20th save in 22 chances. Rivero’s first pitch of the outing was clocked at 102.6 mph by Statcast, the fastest pitch thrown by a National League pitcher this season. Orioles: RHP Jeremy Hellickson (sore back) and RHP Dylan Bundy (left hamstring strain) will both be shut down for the remainder of the season. … SS Tim Beckham (right hamstring) missed his third consecutive game. … CF Adam Jones (leg soreness) did not play for the second straight day. Pirates: SS Jordy Mercer (knee) missed his third straight game. Orioles: After an off day, Wade Miley (8-14, 5.52 ERA) will start the final series of the season Friday against Tampa Bay at Tropicana Field. Miley is 0-4 with a 9.92 ERA in September. Pirates: Ivan Nova (11-14, 4.14) will start a four-game series in Washington on Thursday. Nova has lost four straight decisions and eight of his last nine dating to July 23.